Those that assure you that you never need call for a takeaway because you have the store cupboard weaponry at your disposal to have something on the table in the 30 minutes it takes the chap from the Royal Tandoori to make his way to you on his scooter. Really Gordon? In your house, maybe. I have cupboards laden with dried goods, a dazzling array of vinegars and a pretty steady supply of garlic, lemons and shallots and still I regularly find myself flailing around with no idea what to cook. And no, I don’t want a bloody frittata. Now, a lot of this is my own fault. I entirely accept that a well-stocked store cupboard is essential if you want to cook from scratch, eat well and, more importantly, get dinner on the table with the minimal amount of shopping and hassle. But it does require you a) to be actually quite proficient at that thing called cooking and b) to be organised about buying the stuff to go with your beans and anchovies. The meat, fish, dairy and vegetables that you need unless you actually want to exist on pasta with capers and olives for the rest of your life. And to do that successfully, and hit that perfect balance between having interesting Wednesday night dinner options and not throwing endless amounts of rotting produce away at the end of the week, you need A Plan. That plan could be as simple as eating the same things on rotation every week and having a standard weekly online supermarket order. Or it could be as complicated as deciding day to day what you fancy eating and then wafting around grocers and butchers like Nigel Slater, prodding things and making small talk with your cheesemonger. Owing to my, shall we say, ‘flexible’ employment status, I have quite fancied myself as a Slater-esque consumer of late and have steadily loosened my once sacred ties with Ocado in favour of frequent food shop trips. Most of the time this works reasonably well, but only if I have bothered to apply my mind for 15 minutes on a Sunday evening to what we are all going to eat that week. But even then those days remain where it gets to 7pm and I stare at the fridge forlornly, contemplate just having Chablis for dinner and vow to get our regular Ocado order reinstated. (Today is actually one of those days. I am sitting here typing this as a diversionary tactic, knowing full well that I am going to be standing in Waitrose in an hour’s time trying to find something reasonably healthy for dinner). This recipe came about on one of those Forlorn Fridge days and it slightly reinstated my faith in The Store Cupboard. Or, to be precise, in one particular store-cupboard ingredient that keeps for ages in the fridge and has the ability to turn your homemade stir-fry into something that tastes like it actually comes from the local Chinese. What is this marvellous thing? Chilli Bean Paste, that’s what. 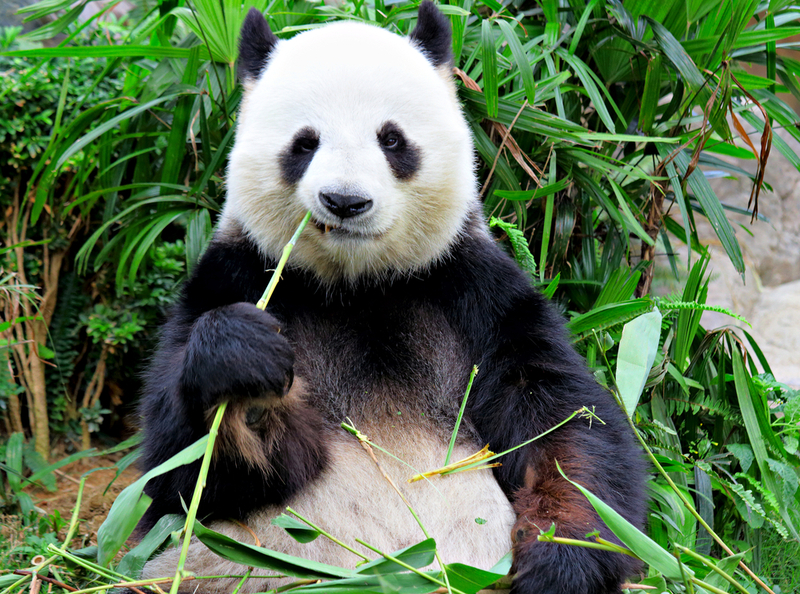 Here’s a panda. Because Pandas are awesome. But also because they are indigenous to the Sichuan province. This paste, sometimes called duo ban jiang, toban djan or toban jang, is one of the key ingredients in Sichuanese cooking and traditionally is made from salt fermented chillis and broad beans with a little flour. 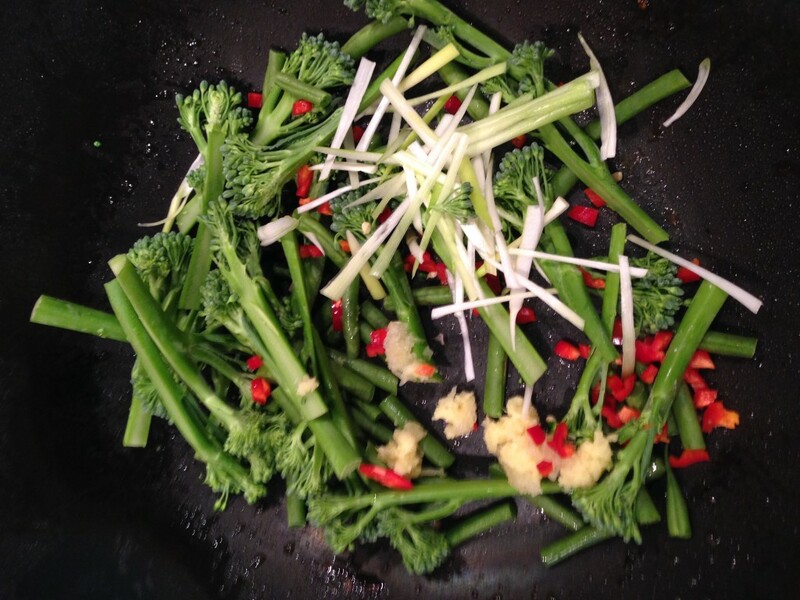 When mixed up with the axis of Chinese awesome – ginger, garlic and spring onion – and some store cupboard things that you will have (because the books told you you must), it makes a really quick stir fry sauce that has a really complex, spicy flavour. If you like miso, you will like this. (Yes, I am trying to say umami without saying umami. And now you’ve made me say it twice). Fermented foods (see also miso, kimchi etc) are increasingly thought to offer quite a few health benefits (probiotics, vitamin B, other stuff) if eaten in moderation but, like with everything, the benefits are likely to be greater in the less processed versions of these products. Unfortunately, really authentic chilli bean paste is pretty hard to get hold of outside China and the ones you see most commonly in shops here are made with a mixture of fermented broad and soy beans and contain various additives, oils and extra spices and flavourings. 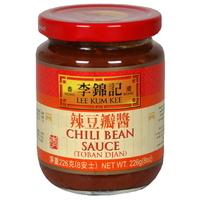 The one I have seen most often in shops here is this one from is Lee Kum Kee (which is actually a Cantonese company rather than Sichuan but seems to be the most universally available). I actually have one from Yeo’s (called Hot Bean Sauce) as that is what they had in our Chinese supermarket – albeit it’s made in Singapore – but again it does have a few more exotic preservative type additions and has absolutely no broad bean whatsoever (it uses soy and black bean). As I have written about before, sauces and condiments are pretty much the one exception we make when it comes to processed foods as I am too lazy to make my own and feel that the time/health/frequency of use/lasting in the fridge analysis comes off in favour of shop-bought. If you are in the UK/Europe, I did recently come across this one on Sous Chef from Pixian, which according to Fuchsia Dunlop (who is the high priestess of all knowledge on these matters) is where the more authentic richer and earthier Sichuan versions originate. Looking at the ingredients list it does seem to be a good bet if you are concerned about nasty additions and/or authenticity as it’s just chilli, broad beans, salt and flour. I think I am going to trade up from Yeo’s. As much as I obviously love E numbers and deforestation-occasioning palm oil. My first encounter with this paste was when making these Chilli and Ginger Chicken Noodles from Leiths How to Cook. Do make this as it is excellent and I have been meaning to put it on the blog since I first made it at Christmas. Things don’t happen very quickly round here, do they? You will probably need to go shopping first though unless you are the type to keep bean sprouts kicking around. I have never made it with stock (I use water) and it is absolutely fine. Availing yourself of 4 tablespoons of ‘chicken and veal’ stock for a stir fry is a bridge too far for me. (Although I bet Gordon and Nigel have some real stock in the fridge at all times. Poised for these very moments). I wouldn’t fret over the Shaoxing rice wine either – I have it because I cook a lot of Asian food and it is easy to get in supermarkets – but sherry (or even gin) would work for the amounts required here. And who doesn’t have gin? The recipe that appears below is a sort of pared back version of this Leiths noodle recipe – I basically stole the sauce and threw it over what I had in, which was some tired green beans and a bag of frozen prawns and ate it with brown rice. I didn’t even have any fresh ginger in the fridge (quelle horreur) but could still rustle this up because I do always have some of this frozen ginger from Waitrose in. I buy the ginger, chilli and shallot packs and they have come to the rescue on many an occasion. The beauty of this sauce though is that it will work with whatever protein/veg (or entirely veg) combo you can throw together and you can have it with rice or noodles. Or maybe on its own or with those weird courgette noodles if you are one of those carb avoider types. And if you are wondering what you’ll do with the leftovers, may I suggest making Dan Dan Noodles (a vegan version of which can be found here), Fuchsia Dunlop’s Mapo Tofu or the misleading named Fish Fragrant Aubergine, that doesn’t contain any fish whatsoever. You can switch the prawns and beans out here for whatever you want. Chicken, pork, beef, squid or firm tofu would all work really well, as would broccoli, carrot or maybe even shiitake mushrooms (I wouldn’t know. Mushrooms are disgusting). You probably want something with some crunch though that will hold up to the stir frying so beans or broccoli would be my top choices. The social and environmental impact of intensive tiger prawn farming in the Far East is pretty staggering and certified sustainable tiger prawns are not that easy to find nor is the advice on what is OK all that clear. I’ve written about it before so won’t bore you all again. I use the Waitrose Organic ones from Ecuador because I read somewhere that the MCS said organically farmed ones are OK but in truth I don’t know if that is still the case. There are lots of MSC certified cold water prawns available from the supermarkets so these are a safer bet if you aren’t sure about the source of king/tiger prawns. Or you could use Scottish langoustines if you are made of money. Mix together all of the sauce ingredients and taste. Add a little more chilli bean paste or honey, depending on how hot you like it. Set aside. 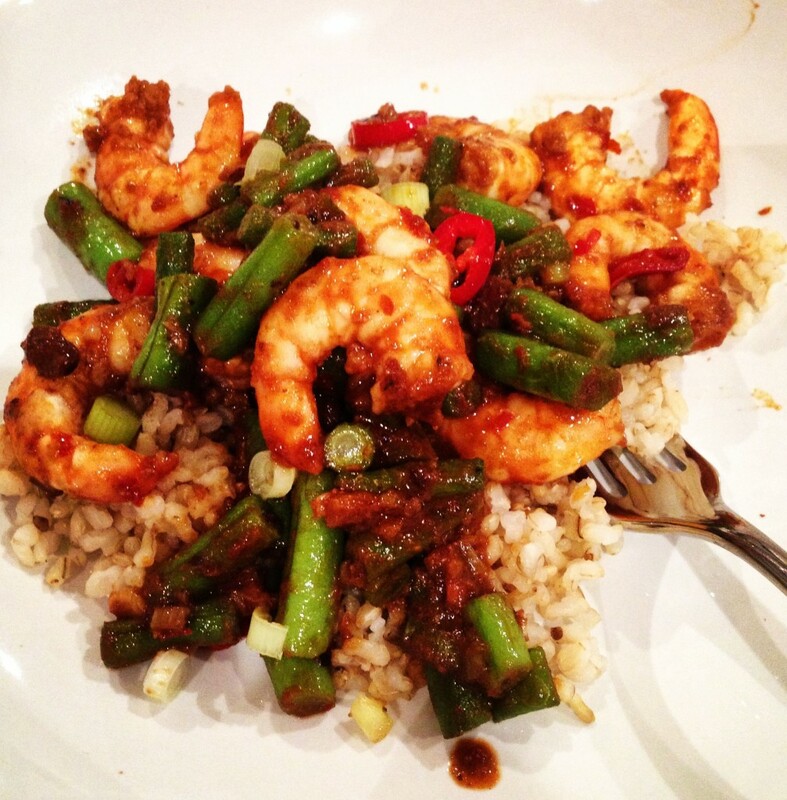 Heat 1 tbsp oil in a wok and when very hot stir fry the prawns until they just turn pink and then remove from the pan. Adding a little more oil if necessary, add the ginger, chilli and sliced spring onion to the wok and stir fry for 1 minute over a high heat. 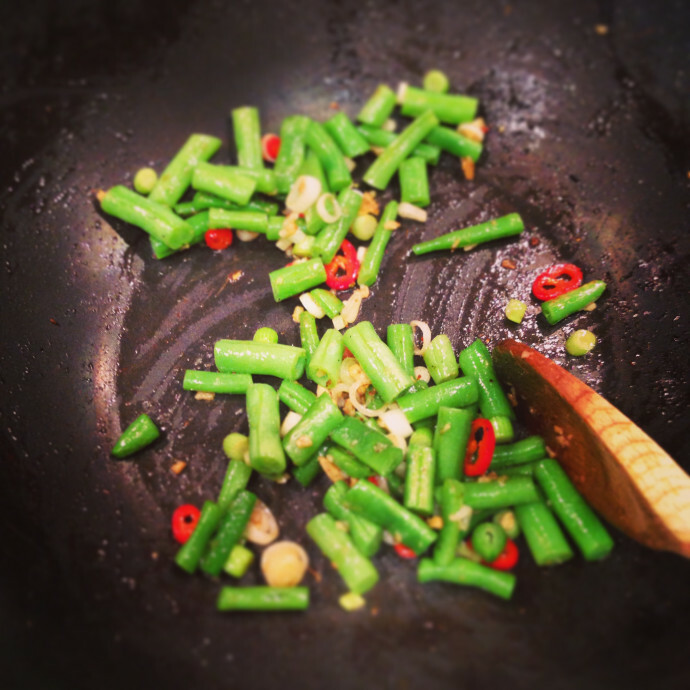 Then add the crushed garlic and the green beans and continue to cook, stirring constantly, for another 2 minutes. Throw the prawns back in along with the sauce, and cook for another two minutes until the sauce has thickened slightly. Eat with the remaining shredded spring onion scattered over the top (which I forgot to do before taking the photo).